Just few weeks after 9mobile introduced the YouTube hourly data plan, MTN has also decided to follow up by silently introducing it's own youtube time based plan. If you love to stream videos online a lot most especially on YouTube then this plan is basically for you. You can use the YouTube plan to either stream or even download on YouTube. The MTN YouTube plan gives you two different options to choose from. The first one which cost N150 lasts for 1hour while the other one which cost N300 lasts for 4 hours. 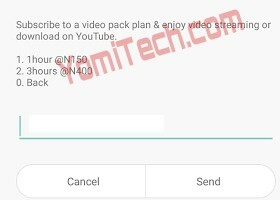 >> N400 gives you 3hours of YouTube streaming. To check the data balance, just dial *559*18#. Can one use the plan to download files outside youtube?